The UK government has set its sights on boosting manufacturing in the country, with a mission to make Great Britain great again in the automotive space. Even though it is far from President Barack Obama’s $4 billion driverless car budget proposal, the UK Government is investing over half a billion of pounds into the automotive space, with the first roll out of unmanned vehicles to start later this year. In the first week of February 2016, eight projects related to smart connected cars were awarded £20 million in a Government and industry backed competition to prepare the country for the driverless car (r)evolution. But how can the UK stay ahead of other European nations such as France or Germany? According to the Government, the fact that the UK has never ratified the 1968 Vienna Convention on Road Traffic is allowing Downing Street to put forward driverless car legislation and related initiatives. The declaration states that "every moving vehicle or combination of vehicles shall have a driver" and that "every driver shall at all times be able to control his vehicle or to guide his animals". By not having these restrictions, the UK’s automotive industry has been growing and shaping up for the next generation of cars, with particular growth seen over the last 24 months. According to the House of Commons, the UK motor vehicle manufacture industry contributed £12 billion to the economy in 2014, 0.8% of total output, but 8% of manufacturing output. This followed a decline in the industry during the recession of 2008 and 2009, when the economic output of the motor sector was £8.4 billion and £6.7 billion respectively. In 2014, 1.6 million vehicles were produced in the UK, 78% of which were exported. The value of exports totalled £26 billion while imports totalled £28 billion, resulting in a trade deficit of £2 billion. However, car registrations in the country reached an all-time high, with over 2.4 million in 2014. 142,000 Brits are employed by the automotive industry. This is far from the record number of people employed in the motor industry, which reached 502,000 in 1971. Today, with over 35 million cars on the road, the UK is also on the top 25 countries based on the number of vehicles per capita at 550 for every 1,000 citizens. The list is topped by San Marino with a ratio of 1,263 vehicles per 1,000 people. The aforementioned £12 billion economic benefit to the economy, could shoot up to £51 billion by 2030, with an additional 320,000 jobs created in this space, according to KPMG. The company also predicts that the development of autonomous and connected cars will help to reduce road traffic accidents by more than 25,000 a year in the next 15 years. Globally, the intelligent mobility market is estimated to be worth £900 billion per year by 2025, according to gov.uk. In order to keep the industry growing, the UK government has over the last months unveiled and entered several smart green autonomous and driverless car boost schemes. In April 2014, Nick Clegg, Deputy Prime Minister, together with the Department for Transport (DfT), announced a £500 million budget aimed at developing and increasing adoption of ultra-low emission vehicles (ULEV). The government said the investment, to be made between 2015 and 2020, will create jobs, reduce emissions and set the agenda for the industry, for towns and cities, and for motorists, "so that Britain remains at the forefront of green technology". Mr Clegg said: "The UK has the potential to emerge as a world leader in the development, design and manufacture of green vehicles. "Owning an electric car is no longer a dream or an inconvenience. This major investment is there to make driving an electric car affordable, convenient, and free from anxiety about the battery running out." However, both the government and the industry have been reminded that the development of green powered vehicles is not only down to the car itself and includes the need for more charging docks. Dr. Kevin Curran, senior member of the IEEE, told CBR: "Electric smart cars on the roads will increase so a key component of future intelligent transport infrastructures will be support for charging stations. "This is crucial as currently many charging stations are part of networks run by service operators however quite often users can only charge at points that are part of their network and this lack of roaming between networks is inhibiting electric vehicle sales." According to Zap Map, who maps all the charging points in the UK, as of February 1, 2016, there were 10,290 stations deployed across 3755 locations. 302 stations were added in January alone. Propelled by growing attention in the driverless car space, on July 30, 2014, the Government launched a driverless cars competition inviting UK cities to join together with businesses and research organisations to host vehicle trials locally. The results were announced in December that year, with Greenwich, Milton Keynes, Coventry and Bristol being selected, and £19 million being provided by the Government to allow testing of automated vehicle technology. Driverless technology was agan driven forward when Chancellor George Osborne unveiled in March 2015 a £100 million budget aimed at driverless car technology. The funding was later revealed to be only half, as an extra £100 million are being invested by the industry itself to create a five-year Intelligent Mobility Programme (IMP). Mr Osborne said in Parliament at the time: "We are going to back our brilliant automotive industry by investing £100m to stay ahead in the race to driverless technology." Desing concept of one of the driverless vehicles to be tested on UK roads. Three months later, the UK become one of the first countries in the word to allow driverless cars to take to the road and the first nation to introduce a code of practice for these sort of vehicles. The code of practice was developed by the Department for Transport in consultation with the UK Autodrive Consortium, Venturer and the GATEway consortia. The document states that at least 30 seconds of data must always be available and that driverless pods need to have someone who can remotely control them at all times. It also said that humans should always be in the car and that in case of incident, the driver (or remote controller) will be held responsible. Speaking to CBR, Nick Cook, CIO at Intercede, said that despite all the focus on such technologies, the industry also needs to pay attention to safeguarding people and data. He said: "Smart vehicles have captured everyone’s attention, from manufacturers to consumers, but this unfortunately also means they have captured the imagination of hackers and criminals too. "In an increasingly connected world, it is vital that anything and everyone connected to the internet is assigned a trusted identity. With identity comes the foundation for communication security." Following from this, in July 2015, Downing Street announced a further £20 million investment aimed at the development of driverless cars, in what ministers hailed as a major boost for the British motor industry. In December, under documents obtained through a Freedom of Information Act, The Telegraph reported that the UK government has held up to five face-to-face meetings with Google to discuss driverless cars. The meetings with the Department for Transport (DfT) occurred over the last two years between January 2014 and July 2015. 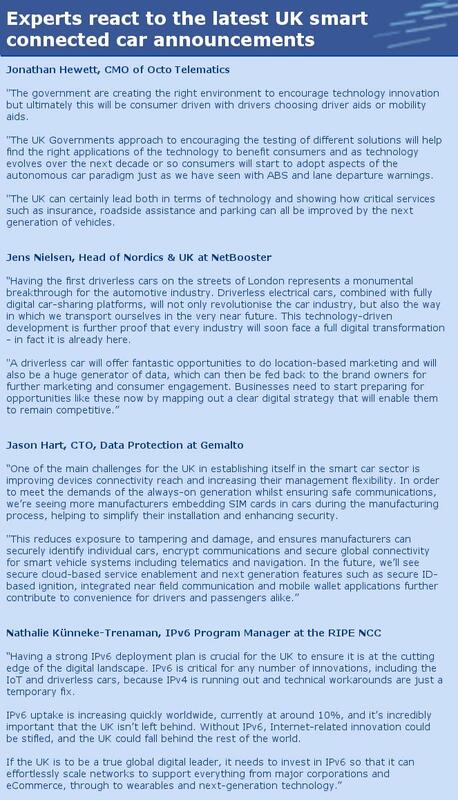 During the meetings, Google execs have described the UK as a leader in developing laws for driverless cars. Sarah Hunter, head of policy at Google X, reportedly said in a meeting: "[Google is] very positive about the non-regulatory approach being taken in the UK [which] places the UK in a good position and could be seen as an example of best practice. "The UK "has shown remarkable leadership in this area. The development of innovative insurance models is an area for UK leadership and a question Google are interested in". Racing into 2016, the UK was leading the driverless and autonomous charge once again, when 11 of the largest insurance companies in the country came together to discuss liability and the insurance impact of driverles cars . The group consists of representatives from 11 UK motor insurers including Admiral, Ageas, Allianz, Aviva, AXA, Co-operative Insurance, Covea, Direct Line Group, LV, Zurich and the Lloyd’s Market. The group is chaired by David Williams, head of underwriting at AXA. The Automated Driving Insurer Group (ADIG) will feed into the Association of British Insurers (ABI) policy and work with the government around how to embrace automated vehicle use in the UK. An ABI spokesperson told CBR at the time: "This group will consider key issues related to automated vehicles such as liability and how they will be insured, to provide opinions and reports to help shape future legislation and practices. "Its work will be feed into the ABI‘s own committees but we also expect it to be of use to other interested parties such as the Department for Transport." According to Thatcham Research (TR), even with today’s technology, including sensors, cameras and real-time driving warnings, a vehicle is 25% less likely to be involved in a serious or fatal crash. Such technologies can help reduce the number of parking crashes, which in the UK account for 23% of all insurance claims, topping up to £1.7 billion. The introduction of smart car technology on the UK roads could also see the country’s private motor insurance sector premiums be significantly reduced over the next decades. With £8 billion in premiums in 2014, this could tumble by as much as 50% by 2025 and 80% by 2040, when driverless car technology is expected to reach the masses. Speaking to CBR, an AXA spokesperson, said: "AXA believe that the integration of semi-autonomous, highly autonomous and fully autonomous vehicles into the UK motor market has the potential to disrupt and fundamentally alter the current motor insurance model. "Not only that, but we understand the safety, social and environment benefits that such vehicles may have and want to be an enabler to technological innovation that can improve our customers’ lives." 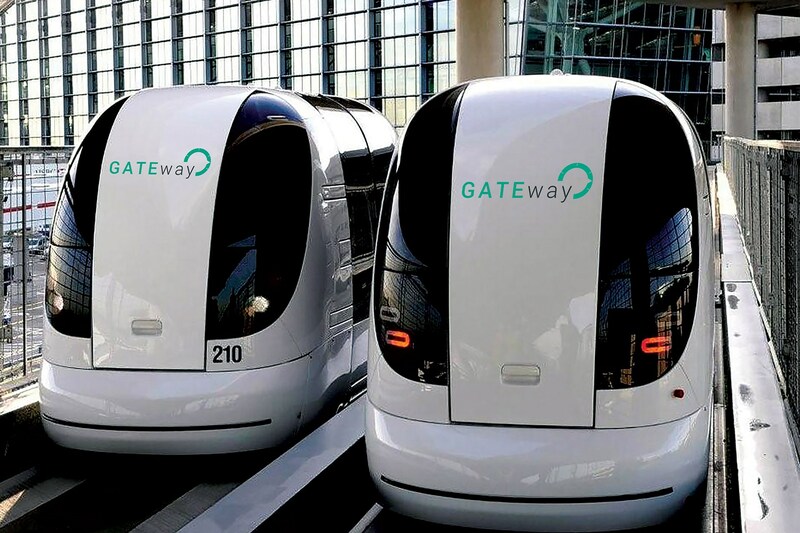 Following from this, last week, it was unveiled that the first driverless cars in the UK will take to the road this summer in the Royal Borough of Greenwich, South East London, under the GATEway (Greenwich Automated Transport Environment) project. The roll out is going to be conducted under close collaboration between Heathrow Enterprises, Oxbotica and Westfield Sportscars, who will lead Heathrow’s driverless pods makeover to adapt them to navigate the streets of Greenwich. The GATEway project is an £8 million project jointly funded by Innovate UK and led by TRL, the scheme will investigate public perception, reaction and engagement with a range of different types of automated vehicles. Professor Nick Reed, academy director at TRL and technical director for GATEway, told CBR: "There might be issues around interactions of the vehicle with other road users and challenging weather conditions, but in this living lab environment in Greenwich, we can address these issues and safely accelerate vehicle development. "If the trials prove successful, we expect these iconic vehicles to become a familiar sight in many cities around the world." This February 1, the Department for Business, Innovation and Skills and the (DfT) announced that eight projects have been awarded £20 million in funding to develop the next generation of autonomous vehicles. Those involved in the projects will conduct research and develop enhanced communication between vehicles and roadside infrastructure or urban information systems, including new ‘talking car technologies’. The £20 million prizes are part of the aforementioned £200 million IMP fund. The government has also announced that the test of driverless vehicles is, in addition to Greenwich, "also being worked on in Bristol, Coventry and Milton Keynes". Transport Secretary Patrick McLoughlin said: "These projects will help profoundly change the way we travel within years, transforming our roads by making travel a simpler experience for drivers, reducing accidents and helping traffic flow more smoothly. They will also bring great benefits to our society and the wider economy by opening up new routes for global investment. "This is a landmark moment and will allow Britain to lead the way in the testing of connected and autonomous vehicles." All the projects have received financial backing from industry in addition to government funding, and are backed by automotive businesses, engineering firms, IT specialists, universities and local authorities. One of the main outcomes of the announcement is the UK Connected Intelligent Transport Environment (UKCITE), a project that will create an environment for testing connected and autonomous vehicles. The project will build the UK’s first connected corridor along 41 miles of urban roads, dual-carriageways and motorways with combinations of three ‘talking car technologies’ and testing for a fourth, known as LTE-V. The project will establish how this technology can improve journeys, reduce traffic congestion and provide entertainment and safety services through better connectivity. Another project has been dubbed as ‘Insight’ and seeks to develop driverless shuttles with advanced sensors and control systems and trial them in city pedestrian areas, with a particular focus on improving urban accessibility for disabled and visually-impaired people. It is worth £2.2 million and has a duration period of 36 months counting with the participation of Westfield Sportscars, Heathrow Enterprises, Fusion Processing, Creative Example, Conigital, and the Birmingham City University. Adding to this, there is the £3.2 million ‘tools for autonomous logistics operations and management’ project lead by Immense Simulations and Improbable. This development is a collaboration bringing together transport modellers and the computer games industry to develop new modelling and help improve the ROI into Connected and Autonomous Vehicle (CAV) fleets significantly, according to the Government. The fourth winning project is called FLOURISH and is aimed at developing tools to improve the understanding of user needs and expectations of connected and autonomous vehicles. The £3.7 million project will be based in the Bristol City Region and will test capabilities in both urban and suburban networked environments. It will be rolled out in a partnership between Atkins, Age UK, Airbus Group, React AI, AXA UK, Bristol City Council, Imtech Traffic & Infra UK, Office for Public Management, South Gloucestershire Council, Designability, Transport Systems Catapult, TSS – Transport Simulation Systems, University of Bristol, and the University of the West of England, Bristol. Another £5.5 million project will be led by Bosch, Jaguar Land Rover, TRL, The Floow, Direct Line Insurance and the Royal Borough of Greenwich. MOVE_UK will be focused on accelerating the development, market readiness and deployment of automated driving systems. The sixth project is the Innovative Testing of Autonomous Control Techniques (INTACT) and will reduce the cost of testing and evaluating autonomous control systems in a safe, repeatable, controlled and scientifically rigorous environment. With a cost of £1 million, it will last for 24 months and will be conducted by Richmond Design and Marketing and the University of Warwick. Next is the £1.2 million Pathway to Autonomous Commercial Vehicles project that will develop a solution to monitor key information from the vehicle and predict safety risks based on analytics. It will be rolled out over 24 months by Tructyre Fleet Management, the University of Portsmouth, Satellite Applications Catapult and RL Automotive. Lastly, the government awarded the i-MOTORS – Intelligent Mobility for Future Cities Transport Systems that proposes to deliver a connected Vehicle to Anything (V2X) system via a mobile platform as a proof of concept (PoC). In addition, the project will develop hardware which will receive and analyse sensory data in real-time from multiple locations via online cloud technology to raise the standard of data-processing in the connected and autonomous driving industry. Roland Meister, head of transport at Innovate UK, said: "This competition has connected together the UK’s fantastic automotive industry, the research base, the insurance sector, public authorities with high growth businesses working in human behavioural science, telematics, information technology, communications, simulation, advanced sensor systems and machine learning. "Through the funding and connections Innovate UK provides we are getting Intelligent Mobility ideas off the drawing board and into our lives, making us more productive, creating jobs, growth and exports." Yet, the government is still faced with some uncertainties expressed by the British public. A survey of 3,497 GB adults by uSwitch.com carried last December, has found that one year since the Government announced driverless car trials on UK roads, reports of collisions have made two thirds (66%) of Brits more concerned about the technology. Almost half (49%) of those surveyed said they refuse to be a passenger in a driverless car, and the same amount does not trust autonomous cars to make nuanced decisions. 20% said they are worried that cars will stop suddenly or drive too slowly and 45% are concerned that the software could be hacked. Two fifths of Brits (41%) expect their insurance premium to skyrocket, even if they do not own an autonomous vehicle themselves. Nick Reed, academy director at the TRL, told CBR: "The speed of adoption of smart cars will be dependent upon a number of factors including overcoming technological challenges, establishing road safety implications, enabling the infrastructure to support connected vehicles, and clarity over legal and insurance requirements." Nonetheless, it is exciting to think that a technology we have been reading and hearing about over the last few years is finally getting rolled out and the future starts to take shape.